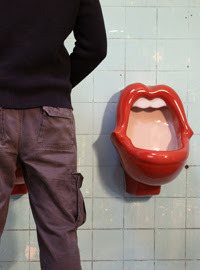 Spicing up the men's room in the Rolling Stone's Museum with the iconic band's logo (red lips), has turned to be quite a controversy in Luechow, Germany. Some women find the urinals extremely offensive. 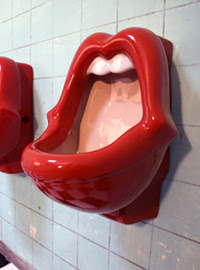 Others remark and remind the women that the logo is modeled after Mick Jagger's own lips. The designer of the piece is a Dutch woman named Meike van Schijndel. I think these are colorful! It's a neat way to implement a logo design, resulting in a redesign of an every day item. Logo design functionality!